fact, it is possible to detect a target gene within 1hr. 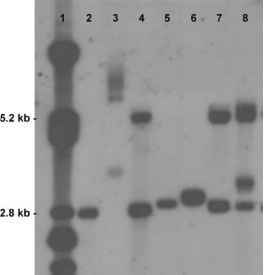 We have also developed a method of rapid gene amplification by adding new primers called loop primers to amplify the loop region of products with which the inner primers do not anneal. 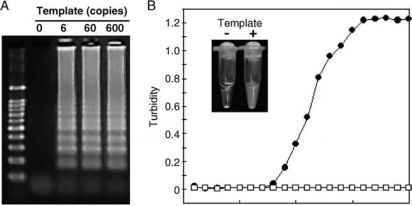 The LAMP method, like PCR, has a sensitivity of a few copies (Fig. 1A). Because a strand substitution reaction is used for the synthesis, no amplicon leads to product inhibition during the amplification, so that the yield of the products reaches as high as 0.5 mg/mL.